Tofu absorbs the flavors of other ingredients with which it is cooked. In this dish, it takes on the earthiness of the mushrooms and the spice of the ginger, garlic, and chiles. To save time, chop the ginger and garlic and prepare the other ingredients while the tofu is marinating. 1. Set the tofu block on one end and cut it into two ¾-inchthick slices. Place the slices on half of a clean kitchen towel, top with the other half of the towel, and press the tofu gently with your palm to coax out excess moisture. Uncover the tofu, transfer to a cutting board, and cut into ½-inch squares. Set aside. 2. Make the marinade: In a large bowl, combine the soy sauce, vinegar, honey, cornstarch, sesame oil, and red pepper, and mix well. Add the tofu and stir gently to coat. Marinate for 30 minutes, or longer, if preferred. Using a slotted spoon, transfer the tofu to a plate and set aside. Reserve the marinade. 3. Trim the base of each mushroom stem. Cut the mushroom caps and the remaining tender stems into ½-inch pieces. Set aside. 4. Heat the wok over high heat until hot enough for a drop of water to sizzle and evaporate on contact, then add 2 tablespoons of the oil. When the oil is hot, add the tofu a small batch at a time, shaking the wok and flipping the tofu over with a wok spatula for 2 minutes, or until evenly browned. Using a wire skimmer or slotted spoon, transfer the tofu back to its plate. 5. Add the remaining 1 tablespoon oil to the wok. Add the mushrooms, ginger, and garlic, and stir-fry over high heat for 1 minute, or until heated through. 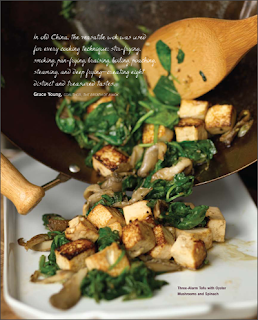 Return the tofu to the wok and add the reserved marinade and spinach. Stir-fry for 10 seconds, or until the spinach wilts. 6. Transfer the stir-fry to a serving platter and sprinkle with the green onions. Serve at once with the rice. Because you’ll be cooking in your wok over high heat, the kind of oil you use is important. Some vegetable oils with a low smoking point, such as extra-virgin olive oil, are not well-suited for high-temperature cooking. Peanut oil, grape seed oil, and canola oil are recommended for high-temperature frying.